Available in Light/Medium & Dark solutions, this Australian made salon quality tanning solution is the tan to have. Affordable & award winning, it is the official tanning sponsor of Miss Universe Australia! Why not get into Bondi Sands with this awesome introductory offer. The spraytan unit is 700 watt with a heater and has proven itself to be one of the most reliable machines we have ever sold. 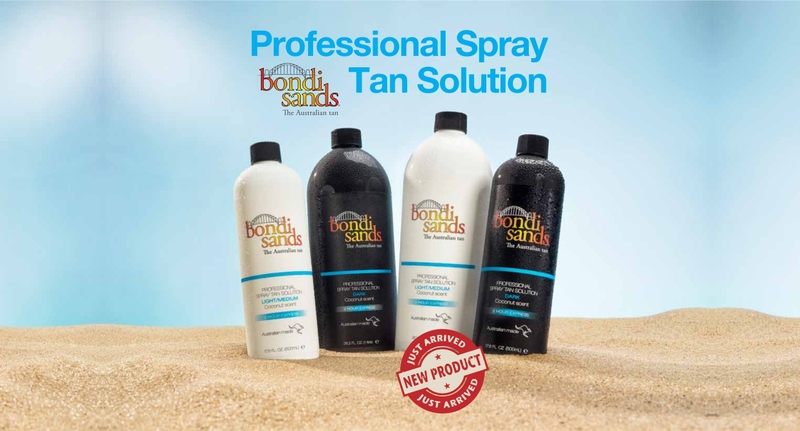 Bondi Sands fast drying professional spray tan solution is enriched with aloe vera, infused with a fresh scent of coconut. Dark Solution contains active ingredient erythrulose to achieve a deep, dark tan. ﻿﻿Want to go darker? Simply leave it on for longer than 2 hours before you wash, it will simply develop further and achieve a deeper, darker tan. The number of spray tans you can achieve per bottle depends on what spray tan machine and gun you use. You can expect to get anywhere between 5 - 8 full body spray tans per 500mL bottle of solution. Yes, if you would like to achieve a deeper, darker tan you can certainly spray an additional coat onto the skin. You can expect to get anywhere between 5 - 8 full body spray tans per 500mL bottle of solution. SO WHO IS USING BONDI SANDS?